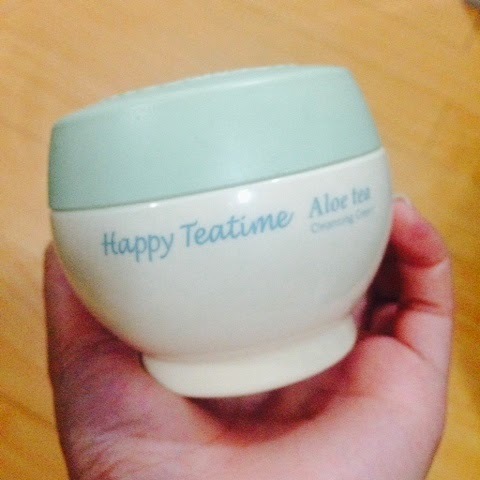 Etude House Happy Teatime Aloe Tea Cleansing Cream | Vanity and Everything in Between. I have a bad habit of sleeping without taking off my makeup. I know it's not a good practice but I just get really lazy at night. I settled with makeup remover tissue just so I could break my habit. I'm okay with almost any brand but my favourite is the one from Etude House. While going around inside Etude House to purchase another pack of makeup remover tissue, I saw the cleansing cream counterpart of it! I figured, it must be good. Without hesitation, I grabbed one and purchased it instead of the makeup remover tissue. It's pretty big for a cleansing cream especially if you're used to seeing Pond's cleansing cream. It doesn't say how many ml or grams this is but it definitely has more product than Pond's. It also has a nice scent - not too strong but not too light. Compared to the cleansing creams I've tried, this is a tad watery but doesn't easily slide down when applied to the face. Here's my just-got-home-from-work look. This is my almost daily look. One layer of liquid foundation + concealer + setting powder + brow gel. That's it. The concealer on my eye bags have faded as that part is already uneven with my entire facial skin. 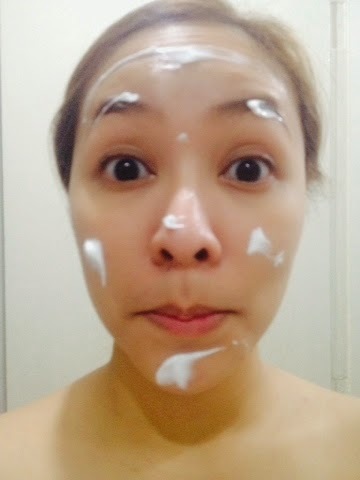 And yes, the photo below is how I normally apply the cleansing cream. A pea size amount is good for the whole face but I like to apply more as I get giddy when I see the foundation melting when I start rubbing the cream against my face. Just do a circular motion when rubbing this on your face. It's up to you how long you will rub your face as you're the only that knows how much makeup you've applied on your face. 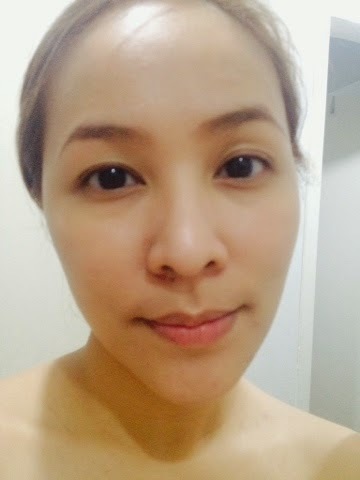 As for me, I don't put too much makeup on weekdays so I'm pretty sure that the dirt/makeup is just right. 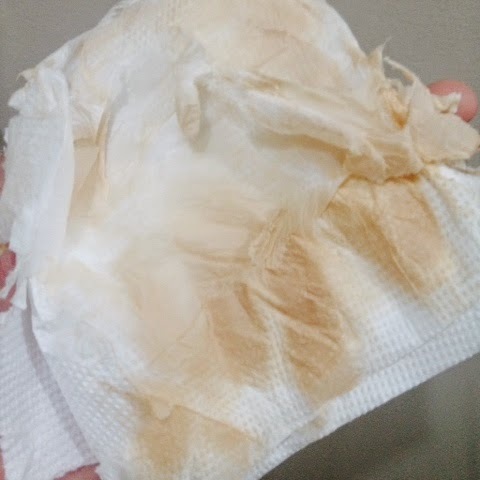 When you think you've rubbed enough, clean your face by wiping it off with tissue. The photo below shows how much makeup was removed on my face. If you will base it on my 3rd to the last photo, it doesn't even seem I have makeup except for my brows. It leaves a little greasy feeling after you've wiped off the cream. Just wash your face with any facial cleanser that you have. Then your face is squeaky clean. 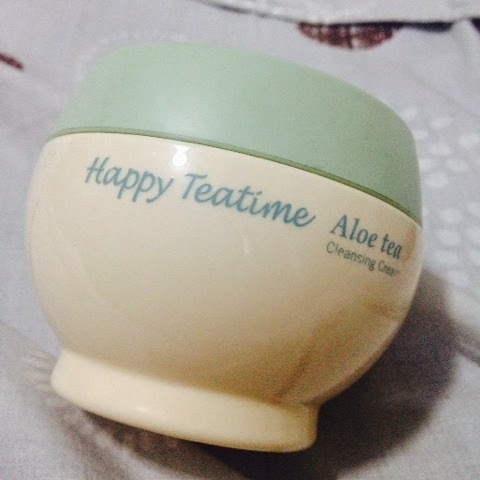 Happy Teatime Aloe Tea Cleansing Cream comes in 2-3 variants (I forget). It also has a tissue makeup remover counterpart which is great for travelling. It's the one I always bring when I'm out of town or out of the country. Let me know if you've tried this and if you like it, too! I was able to try the Happy Tea Time line when I asked for a remover to erase the swatches from my hand. I notice that it does feel less greasy than Pond's cold cream. All the variants smell so nice! my fave is the milk one! (flesh in color) i love the smell and how it really cleanse the face! kahit tissue lang afterwards.. reminds me of my old ponds cold cream =) plus the price is really worth it!!!! Highly agreee on the smell! Sarap amuyin! Cos of its price point, this is bettet than pond's cold cream! Try this! This is really a good one! This is probably the reason why I halted using Shu's cleansing oils! Although I'm curious if this cleansing cream can take off waterproof mascara too? Have you tried it already?